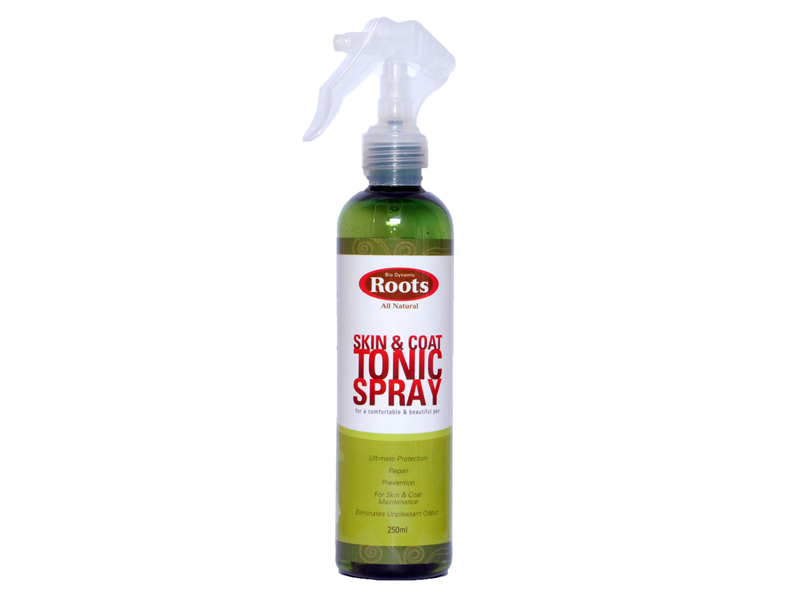 Roots All Natural Skin & Coat Tonic Spray is an all-natural herbal pet spray It helps heal eczema and is effective on all forms of rash, skin allergies, abscesses, fungal disorder, inflammation, minor cuts and scrapes. Roots All Natural Skin & coat Tonic Spray is effective in promoting fur growth and facilitates healthy tissue granulation of skin with no excessive fibrosis. Also, it is excellent in curing dermal irritation caused by fleas & ticks, reduces the urge to scratch, therefore protect the area from getting worse. All active ingredients are derived from medicinal plants. Contains a special blend of herbal extract such as Tumeric, Sugar Apple, Neem Oil, Sea Holly etc. and formulated with Advance Herbal Technology (AHT). Does not contain toxic ingredients, artificial coloring or fragrances.